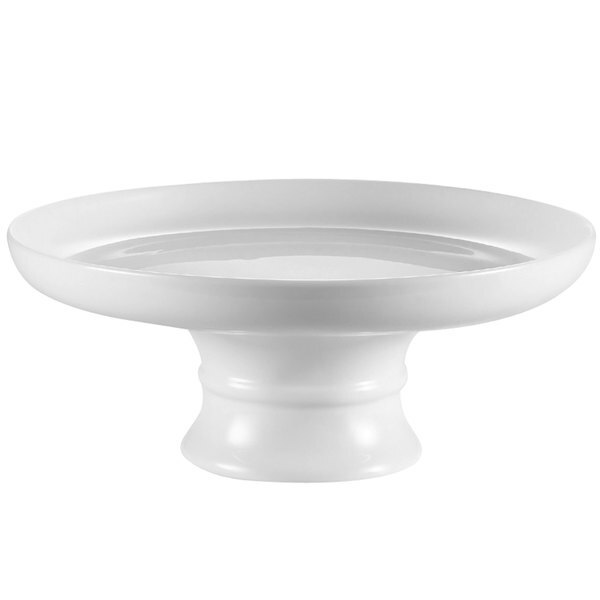 Create a variety of dazzling food displays with this CAC CKST-10C 10" x 3" super white china coupe cake stand. Brilliantly elegant, the stand is a versatile, must-have for caterers, buffets, hotels, and bakeries. Its super white color showcases decadent dulce de leche cake, rich carrot cake with cream cheese icing, or even rustic wedding cake with fresh summer berries. Whatever the menu, color palate, or occasion, this cake stand is just the place to display your deliciously sweet masterpiece! To withstand frequent, repeated use, the stand is made of durable china. This makes it perfect for bakeries that rotate displays on a regular basis or for venues that cater countless events. Plus, it's not just great for desserts; use it to display savory hors d'oeuvres, from stuffed cherry tomatoes to fried macaroni-and-cheese squares. Or, show-off breakfast muffins, oatmeal cream-pie cookies, or seasonal pumpkin spice cupcakes. The stand's sleek coupe design features raised edges to hold in whatever aesthetic creation you display!